Issued free on arrival at airport – 30 days, all countries. Unlimited entries per year. Issued free on arrival at land border – 30 days for 55 countries – check your own country against the lists found online. Only two land entries allowed per calendar year. Your passport must have at least 6 months validity. Strictly speaking, proof of funds at 10,000bt and POOT (proof of onward travel) which means an airline ticket from Thailand both required. Tickets showing exit by land border, trains, buses, flights in other countries are not accepted. The visa exemption can be extended for further 30 days in Thailand at a local Immigration Office for 1,900bt. Bought in country of residence or neighbouring to Thailand. 3 months validity, 60 days permitted per entry, can be extended for further 30 days in Thailand at a local Immigration Office for 1,900bt. Bought in country of residence only with strict criteria including bank statements, employer letters, plane tickets and hotel reservations. 6 months validity, 60 days permitted per entry. The Visa Exemption is the most commonly used method for entering Thailand. On landing at an Airport, you are are stamped permission to stay for 30 days. This covers most people on their holidays. The stamp can be extended at a local Immigration Office (in country) for 1,900bt for a further 30 days, after which you then have to leave the country. 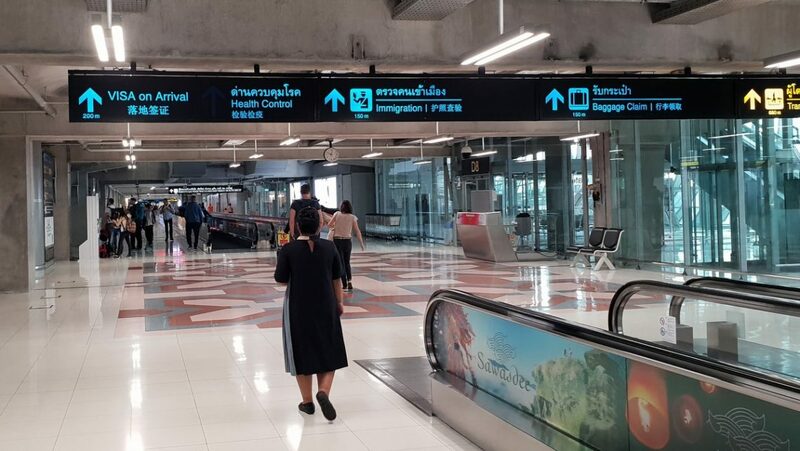 If you are coming and going from Thailand into neighbouring countries, you can re-enter using another Visa Exemption stamp, with 30 days granted for 55 countries, lists available online of those nations. You are no longer able to exit and immediately re-enter (visa run) with visa exemptions and only 2 visa exemptions are permitted in one calendar year if entering by a land border. Always carry your onward plane ticket printed out (not digital) in case requested. If you wish to stay longer than the 30 day Visa Exemption without leaving the country or going to pay for an extension, the easiest option is to buy a Single Entry Tourist Visa from any Thai Consulate or Embassy, with fees as per their websites. The length of stay is 60 days from day of arrival (the single entry of the visa). It may be extended at the local Immigration Office (in country) for a further 30 days for 1,900bt, as long as this is done before the 60 days has expired, with the date stamped in your passport, next to the stapled-in white departure card (TM6), the last day possible. This will mean you have 90 days in total before you need to leave the country. The Single Entry Tourist Visa itself shows a validity of 3 months, but this has nothing to do with length of stay, simply stipulating that you must enter the country (i.e. use it) before the expiry date shown (which will be 90 days from when the visa was issued). After the 60 days (or 90 if you buy that extension), having left the country, you can then re-enter again with either a new Single Entry Tourist Visa bought at a Consulate in one of the countries bordering Thailand and start the 60 days (or 90 if you buy that extension) process once more. Or you can re-enter on a Visa Exemption stamp, granting you 30 days (airport or land). How many times you can buy back to back SETV’s and which country has the most amenable Embassy or Consulate for issuing said back-to-back Single Entry Tourist Visas is discussed and updated on many websites. What is misunderstood with a Single Entry Tourist Visa is the Single Entry. Simply put, you use this up when you first enter, so whilst you can stay for 60 days and then extend in country for 30, if you step over the border, the visa is immediately finished/cancelled. This is regardless of whether you have used up its full quota of days. As an example, were you to leave the country after 20 days to pop into Cambodia to see the temples and then come back to Thailand by air or land, you will be given a 30 days visa exemption stamp. You do not pick up the 60 day Single Entry Tourist Visa from where you left off, so the 30 days remaining are lost. If buying a Single Entry Tourist Visa but also wanting to travel a little outside of Thailand, therefore, use up your days before you go. Alternatively, you can also get a re-entry permit from the local Immigration office at 1,000bt. This allows you to come back in on the existing visa but you do lose the days spent outside Thailand off that visa. Multiple Entry Visas are issued only in your country of origin. There are strict criteria which must be met for the visa to be granted. Though varying from country to country, these involve bank statements showing at least $6,000 for at least 3 months, letters of employment or if self employed, assessments forms and registration documents, plane tickets in and out and hotel reservations. The visa is valid for 6 months from date of issue, with 60 days granted per entry. After that, you must leave the country and on re-entry will be granted another 60 days or you can extend in-country by another 30 days for 1,900bt at a local Immigration Office, as is possible with the Single Entry Visa (SETV). On the last day of the 60 days (or 90 days if you have extended in-country), you can hop out at land border, stamp into the neighbouring country, turn straight around back into Thailand and re-activate the next 60 days. You then then extend that 60 days too by another 40 days in-country. The Multiple Entry Visa itself shows a validity of 6 months, but this has nothing to do with length of stay, simply stipulating that you must enter the country (i.e. use it) before the expiry date shown (which will be 180 days from when the visa was issued). There is nothing to stop you leaving on the days just before the actual visa expiry and coming back in to re-activate another 60 days. This means, though the visa is finished, you are still permitted to stay until those 60 days are up and so in effect, it will give you 9 months in the country (if you extend that too in-country for a final 30 days). Check forums like thaivisa for all the latest updates. You will need to take the following documents and copies if you want a 30 day in-country extension to your 30 day Visa Exemption, Single Entry Tourist Visa (SETV) or Mutiple Entry Tourist Visa (METV). You can get the actual application form (TM7) on arrival at the Immigration Office. The cost is 1,900bt, THB cash only. You can extend up to a week before the expiry date, with the extension dated from the date in your passport. If you expiry date falls on a weekend or holiday, it is very important that you make the extension in the days before. You cannot extend if it has already run out. There are a whole host of other longer stay visas, known as Non Immigrant Type ‘O’. These include O (dependent), O-Ed (education), O-A (retirement) and O-B (business), with details found at www.mfa.go.th/main/en/services/, the official site for visa information and procedures. We also do our own comprehensive round up in our property buying page here. Once the strict criteria for issue are met, Non Immigrant Type ‘O’ visas have a year validity. Annually, you can then apply for an extension (also 1 year validity) but you will always have to satisfy the same criteria as at the original application before said extension is issued. If holding one of these visas and provided it has been issued in Thailand, you need to report to an Immigration Office every 90 days but you never have to physically leave Thailand. If you do wish to leave the country, you must first obtain a Re-Entry Permit before exiting. If you leave without getting the permit, the visa is cancelled and you have to start the whole process over. To confuse matters, please note that consulates and embassies in different countries issue their own version of retirement and business visas (with 3 month and 6 month vailidity), which work in a different way. Such visas do require you to leave the country after 60 days (or extend for 30 days and then leave) in order to activate the next 60 days – always check the stamp in your passport closely for exit days. For 90 day reporting, you will need to take the following documents and copies. You can get the actual application form (TM47) on arrival at the Immigration Office. There is no charge. You can get the actual application form (TM8) on arrival at the Immigration Office. The cost is 1,000bt for a single entry and 3,800bt for multiple entry, both valid for as long as the visa or the extension stamp. Overstaying your visa by a few days is expensive rather than a serious problem, but technically you are breaking the law. The first day is not charged but after that, it is 500bt per day, so two days makes 1,000bt, 3 days 1,500bt and so on. Children over 7 are eligible for the fine. This is normally paid at the the airport as you leave the country. Long term overstayers are now being targeted, fined and thrown out with Barred from Visiting Thailand stamped into their passports. The length of that ban is taken on a case by case basis, 1 year upwards. After a 3 month hiatus, Laem Ngop Immigration has now re-opened (July 2018). Laem Ngop is the small fishing town opposite Koh Chang, also home to Laem Ngop Pier (for Koh Mak) and the Naval Museum. It is 3 kms or so from Centerpoint Pier and 8kms from Ao Thammachat Pier (both for Koh Chang). Laem Sok Pier (for Koh Kood) is 40 kms away in the Trat City direction. Trat itself is 17 km away. To reach Laem Ngop Immigration from Koh Chang, take a ferry from Centerpoint Pier (08.30am, 09.30am etc), 80bt per person and then a 10 minute songthaew taxi at 50bt per person. You should ask the driver to wait as there may be no other taxis to bring you back. If coming from Koh Mak, you arrive at Laem Ngop Pier by speedboat, It is a 10 minute walk to the Immigration, simply take a right turn opposite Thida Tours at the foot of the pier. You could also use a songthaew. If coming from Koh Kood, you will need a private car, please do contact us for a quotation. On Koh Chang itself there is also a tiny Immigration Office opposite Flora i Talay Resort on Chai Chet Beach. This can deal with general questions and also 90 day reporting for those on longer visas. Any service that you need to pay for such as extensions to tourist visas or re-entry permits are only processed over at Laem Ngop. 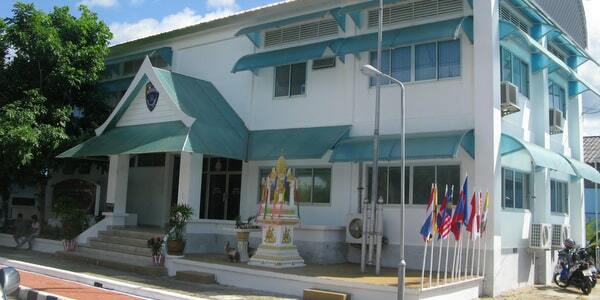 Laem Ngop Immigration can be contacted on 039 581-776, open 08.30am to 16.30, closed for lunch from 12.00pm to 13.00 – same hours for the Koh Chang office, whose number is 039 597 261. From Koh Chang, there is a visa run service using a share minibus, which runs to and from Had Lek/Cham Yeam Border. Operated by DD Mhuek, the minibus costs 1,000bt per person with ferry ticket, with collection from 06.30am to 07.50am from your resort for the 08.30am Centerpoint Ferry. The border is 100 minutes from the pier, so takes around 2 hours with an LPG stop included. At the border, the driver waits while you stamp out of Thailand (left hand side) and walk across no-mans land into Cambodia. If you have not pre-bought an evisa, then you need to buy that there and then, 1,600bt to 1,700bt, passport photo needed. You then stamp into the country at one window and move to the next one to be stamped immediately back out, a process which costs 300bt local tax. You then walk back across to Thailand, fill out the TM6 arrival/departure card (same as the one on the aeroplane), present this at the Immigration window and you are stamped back in with the new requisite amount of days. Always check your passport and the new stamps before leaving the border area. The minibus drops you back at your resort on Koh Chang at the end of the day around 17.00. We can organise this for you – please contact us here.